The R-F-T AR-70 is a stereo tube condenser microphone. In a sense, it is comprised of two of the company’s AR-51 within a single housing. The AR-51 amplifier circuit incorporates an ECC81/12AT7 dual-triode tube, sourced either from Mullard or RFT, and a Haufe T14-style output transformer. The same transformer is used in the company’s 251-series mics, such as the Ela M 251E. In the AR-70, both of the triode circuits of the tube are used independently, with two independent amplifier circuits and a matched pair of output transformers. 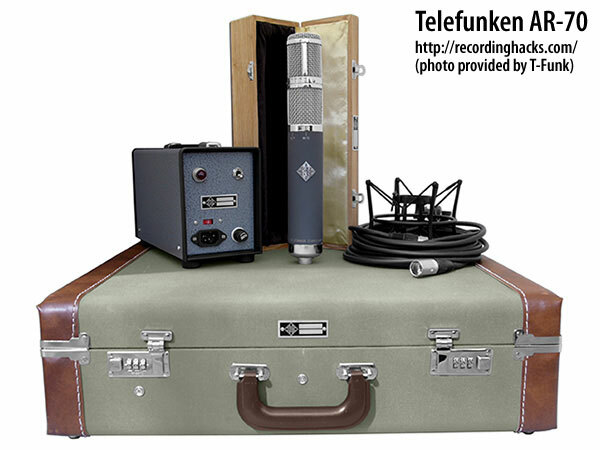 The AR-70 replaces all three of the M216 stereo tube mics in Telefunken’s product line. Due to the AR-70’s fixed-Cardioid lower capsule, and the lack of a M-S decoder on the power supply, it most resembles the “M216 Stereo M/S-X/Y,” albeit with a different circuit and transformer. 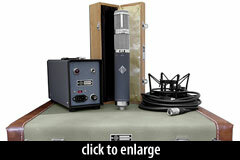 The mic ships with a power supply, cable, elastic shockmount, a padded wooden storage case for the mic, and suitcase.